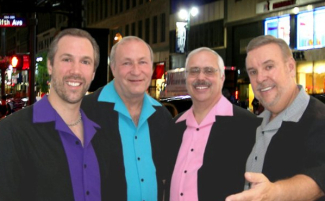 Travel back in time tonight when the a cappella Doo Wop group Flipsydz perform golden oldies at the Boat House. Flipsydz, (Flipsides) will bring a “a little bit of the Bronx”, to the lake, according to the Schroon Lake Arts Council, who organized the concert. The group, whose members include accomplished operatic singers, choral members and solo artists, will perform some of the best loved rock n roll songs from the 1950s and 1960s. We are thinking fans of the Jersey Boys, will be right at home tonight. Showtime is at 8 pm in the BoatHouse – not under the street lights. For info call 518-532-9295.